Cannabidiol (CBD), the cannabinoid in marijuana that researchers believe acts on the brain’s serotonin system, is known for its soothing and anti-inflammatory properties. That’s one reason it’s the most buzzed about ingredient to hit the health and wellness market in, well, just about ever. It’s also huge business, and that business is only expected to grow, with sales anticipated to reach almost $2 billion by 2022, according to a report published in 2018 by the Hemp Business Journal. In 2018, sales of CBD-infused products exceeded $500 million. Even Coca-Cola said it’s “closely watching the growth of nonpsychoactive CBD as an ingredient in functional wellness beverages around the world,” in a report on the company’s website. One reason for the tremendous growth is the 2018 Farm Bill that changed federal policy, making industrial hemp an agricultural product, meaning it’s technically legal to sell and buy in all 50 states (although three states say it’s still illegal according to state law). In order to be considered an agricultural product, however, the hemp must contain 0.3 percent or less tetrahydrocannabinol (THC), the psychoactive ingredient found in both hemp and marijuana plants. Products with more than 0.3 percent THC are considered marijuana, which is only legal in 10 states. Since passage of the law, CBD has become the hot new ingredient in products ranging from bath bombs to lip balms, IPAs to cold brew, and face creams to ice cream. Products made with CBD derived from industrial hemp do not contain enough THC to make you feel high whether you eat it, drink it, or slather it on your skin. So why is CBD so popular? There is some evidence that CBD can help treat a host of conditions, ranging from anxiety and addiction to acne and high blood pressure, and it can also reduce the nasty side effects of cancer treatment. 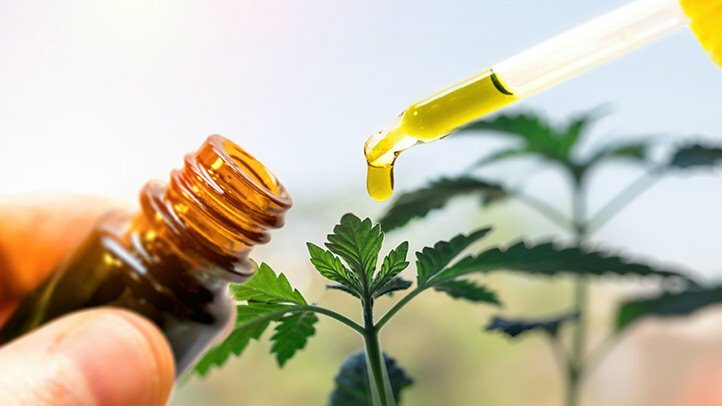 One of the challenges facing consumers as they shop for CBD products is that, with the exception of Epidiolex, which the U.S. Food and Drug Administration (FDA) approved in June 2018 for the treatment of two rare forms of epilepsy in children and young adults — Lennox-Gestaut syndrome and Dravet syndrome — most products containing CBD aren’t regulated for safety or effectiveness from oversight agencies like the FDA. In that sense, they’re similar to nutritional supplements, where it’s often buyer beware. In fact a study published in January 2019 in the journal Forensic Science International found many CBD products contain a variety of ingredients you might not want, including dextromethorphan (a chemical found in some cough syrups) and melatonin. “Something like 70 percent of CBD products are mislabeled,” says Dustin Sulak, DO, an integrative medicine specialist in Falmouth, Maine. Dr. Sulak is an expert in cannabis-based medicine and the former owner of a CBD testing lab. “I think it’s because the industry is growing so quickly,” he says. Sulak recommends purchasing CBD products from a medical provider and making sure they can provide a certificate of analysis that tells you the batch number and harvest dates. The bottom line is that when it comes to CBD products, determining what’s safe for you is entirely up to you, although there is at least one resource that could help: the Hemp Industries Association, a nonprofit, membership-based trade organization whose members support, among other issues, accuracy in labeling and the use of sustainable and organic practices. Dispensaries In states where medical marijuana is legal (33 states plus the District of Columbia, Guam, and Puerto Rico), you can often find a variety of CBD products in marijuana dispensaries. In the states where marijuana isn’t legal, but where the use and sale of “low THC, high cannabidiol” products is allowed, you may find products like nutritional supplements, muscle-soothing balms, and similar products at some pharmacies, or in a dispensary that sells only CBD products. Spas Since CBD has been shown to reduce inflammation related to acne and can also reduce anxiety, it’s no wonder it’s being featured in spa treatments, like the Colorado Bliss CBD Classic Massage offered at the St. Julien in Boulder, and in nail salons offering manicures called “canni-cures.” If you prefer at-home spa-like treatments, you could try one of Mantra Mask’s many options, like the CBD collagen mask, or the CBD anti-aging mask. Restaurants A number of restaurants from coast to coast feature foods infused with CBD. At Fuel, a Philadelphia-based chain, you’ll find CBD-infused smoothies like the Berry Dream and the Orange Dream, each with 0.5 milliliters of CBD added. At Blue Sparrow Coffee in Denver, you can wake up with a cup of CBD Nitro Cold Brew, and at By Chloe, which has restaurants in the United States and the United Kingdom, the Feelz menu includes cupcakes and rice-cereal treats with CBD. Yoga and Meditation Studios Yoga, meditation, and CBD may seem like natural companions. That’s why places like New York City’s meditation studio Inscape offers sessions with “optional CBD,” and Lit Yoga in Los Angeles has classes with CBD in tea. Beauty Products A number of popular mainstream beauty brands and stores are now offering CBD products. Cannabis Sativa Seed Oil Herbal Concentrate by Kiehl’s is derived from hemp and claims to reduce skin redness. At Sephora, you can find Josie Maran’s Skin Dope Argan and Hemp Oil, which claims to improve dullness and uneven texture. And at Ulta, Cannuka’s CBD Calming Eye Balm claims to reduce undereye circles. Then there are companies like Kush Queen, which specializes in beauty and lifestyle products made with CBD. Their line includes bath bombs, shower gels, lotion, body and lip scrubs, and more. At the end of the day, CBD may be the latest “it” compound — and there is evidence that CBD-infused products can help some specific health issues — but it’s not a cure-all.